Ernest was born in 1884 and was one of a family of nine children: seven girls and two boys. of Prospect Place, built in 1823. Home was a small terraced house known as Prospect Place and situated between The Three Horse Shoes and The Grapes public houses. 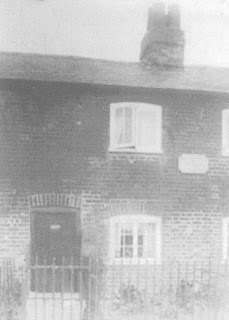 The 10 houses in the row were mainly of one room downstairs and one room upstairs, but because the Jordan family rented an end house next to The Grapes, they were blessed with a second small bedroom. In a deed of 1833 the 10 houses were required to share one well, one pump and one toilet. Just when the facilities were improved has not been established, but certainly by the time the houses were demolished during the 1920s and late '30s tapped water and a shared toilet block had been provided. By present standards it is difficult to understand how the large family managed. Ernie attended the Eton Wick Infant School until February 2nd 1891 when, at seven years old, he went to Eton Porny School. The Porny records state he was an orphan, although his mother, Jane, still managed the family. Apparently the father had died, and it was not uncommon to be considered an orphan if one parent had gone. Ernest left school on October 3rd 1898, and doubtless the family budget was eased by whatever he was able to earn. As the family married and left home the living conditions too were eased. Some of the family are still well remembered. Sally became the wife of a village coal merchant (Bill Parrot), and William and Frances remained unmarried and lived on in Prospect Place for many more years. Ernie was 30 years old when the Great War started, but he quickly volunteered for military service. Historians of the war are so used to concentrating upon the Western Front that they often refer to other theatres as the "side shows". Ernie's service and ultimately his life was spent at the side shows of Gallipoli and Mesopotamia (Iraq). For many thousands like him these were certainly anything but side shows. The Gallipoli offensive was launched on April 25th 1915. For several weeks little progress was made against the Turkish defenders until in June it was decided to send strong reinforcements. The only trained and uncommitted troops available were the 10th, 11th and 13th Divisions. The 13th arrived in early August and consequently had the advantage of serving in trenches alongside battle-experienced men near Cape Helles, at the foot of the Gallipoli peninsula. They later fought at Anzac Cove, north of Helles and overlooking the Aegean Sea. By the end of the year the decision was taken to evacuate all the troops. The 13th Division returned south to Cape Helles and there formed a rearguard defence, allowing other Divisions to embark. By early January 1916 all had been successfully evacuated from Gallipoli. It had been an ill prepared venture, meant to indirectly help the Russians. Most of the Divisions were transported to the Western Front, but the 13th was taken to Mesopotamia, where the enemy was still the Turks. British and Indian troops had been on the offensive there since October 1915 and had pushed forward to within 20 miles of their objective, Baghdad. After sustaining much sickness and casualties they were forced to withdraw and came under siege at Kut al Amara. The Kut siege lasted 147 days from December 7th until April 29th, by which time the food and general conditions made it impossible to continue and the force surrendered. During the siege a relieving column, which included the 13th Division, made several determined attempts to break through the besieging Turks. Illness was widespread in the inhospitable climate, with cholera, malaria, dysentery and fleas being endemic. With the failure of the relief column to take Kut al Amara in April 1916 it was to be several weeks before a stronger force could be assembled and moved up the long narrow country. Ernest Jordan was reported as dying on August 20th 1916. His overseas service had taken him far away from the European theatre of war, and had resulted in him serving in two very inhospitable regions, surrounded by much climatic sickness and death. It was sickness which caused his death, and not direct enemy action. He was a single man and 32 years of age. He is buried in the Amara War Cemetery, Iraq, Plot 9; Row B; Grave No. 18. There are 22,000 graves in Iraq and more than 41,000 "missing" are commemorated on memorials as the consequence of the Great War of 1914-18. The Amara Cemetery contains 4,621 graves. Different materials and headstones were used in Iraq to overcome a problem caused by the destructive salt nature of the ground. Ernest is commemorated on the Eton Wick Memorial and also on the Eton Church Memorial Gates.